Welcome to the Russian Step By Step Learning System! 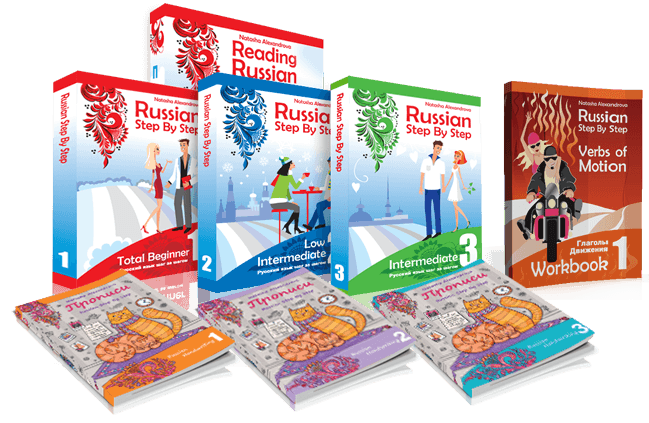 Are you learning Russian and want clear, straightforward materials to guide you to success? - all our audio files(lots of them!) are free direct download with the purchase of the books (one large file per book or individual files playable on the website). The system was created by a teacher with over 20 years real classroom experience to provide the best possible curriculum for the learners of Russian of all walks of life. Our books are used by schools, language centers, universities, libraries, private tutors, self-study language enthusiasts and polyglots of all ages in the US, Canada, Latin America, Europe, China, Australia and many other countries. We offer volume discounts and complimentary teacher trainings. Please email us at info@russianstepbystep.com if you have any questions and welcome to our learning system! "For many who are beginning to study Russian, the Cyrillic alphabet presents more of a barrier than most texts and self-help books seem to acknowledge. The absolute beginner often needs a source that introduces specific sets of the letters and accompanying sounds and then proceeds to provide drills (via simple vocabulary) for practicing them. This workbook is provides that source in a "step-by-step" fashion that is very effective. I would urge anyone using the workbook to get the audio component; I think that it should be an integral part of the workbook, but it isn't and so you will need to go to the web site russianstepbystep.com in order to place your order for the download or the CD. Apparently, the audio component was recorded in casual circumstances and you can hear many extraneous background sounds (including people talking and laughing); at the same time, the speaker's voice is clear and so those extra sounds can be ignored. 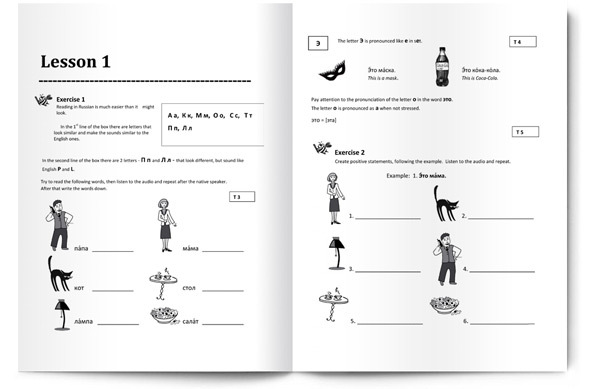 If you have prior experience with Russian, you may find that this workbook is too simple. But if you are starting Russian (and especially if you are starting out on your own), this is an excellent place to begin." "This is, in my opinion, the best method for learning Russian language from scratch for English speaking people. The books are very well organized, very clear, and up to date. The collection is well synchronized and the best of all are the many practical exercises in each chapter with plenty audio back up to develop the ear and pronunciation. Russian language is a difficult language to learn, specially for English speaking people, that's why is important to have a lot of sources to go to. Instead of looking all over to get enough and clear information, one can have it with the Russian Step by Step collection. They also have a very good web site with lots of free extra information, including videos. I, myself had no problems downloading the audio. Real teacher in touch with sudents every day develops materials for students of all walks of life. 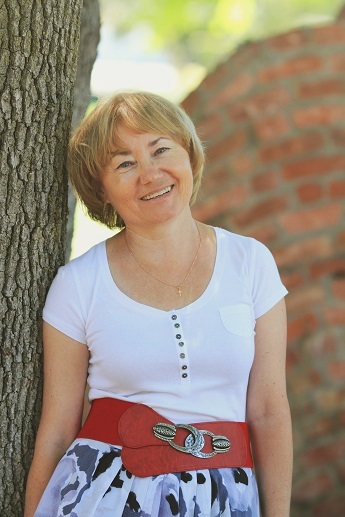 Natasha has been teaching Russian to foreigners for over 20 years, first in Ukraine and then in the USA. She has a Bachelor's in Linguistics and a Master's Degree. Natasha attended a number of teaching trainings, conferences and seminars. Before her career as an author Natasha was a head teacher and observed countless lessons, giving feedback to the teachers about how to improve the lesson, as well to the students on how to benefit the most from the program. Natasha watched many students struggle with learning Russian via complex textbooks that present a lot of material quickly and without allowing the student time to internalize the new information. She quickly started developing her own way of presenting the materials and realized that there is a very simple way to learn any language: just by dividing something complicated into simple pieces and mastering the language step-by-step. Her many years of work and experience culminated in a book series of her own - Russian Step by Step. 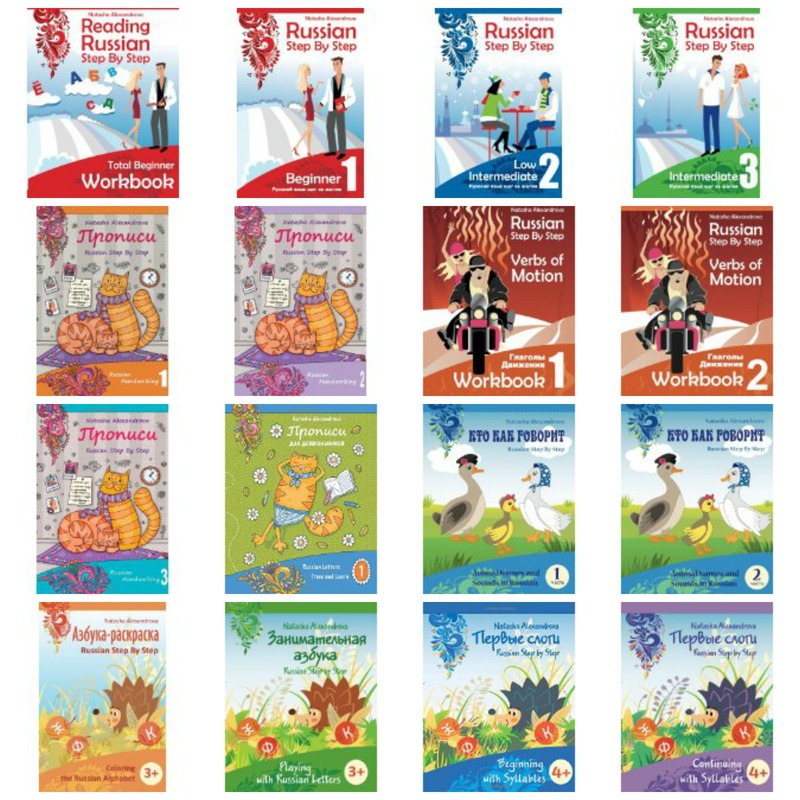 These books are easy to follow and, at the same time, are teaching real Russian. In RSBS books students will find dialogues from everyday life, exercises to help master those dialogues, and texts to help in remembering them. The series has two branches: adult and children's books. The adult series is aimed to non-Russian speakers who want to learn it for any reason by themselves or with a teacher. Many hours of audio that comes with the course books allow the student to pick up the correct Russian pronunciation. The children's series is aimed to bilingual kids or kids who are heritage learners and their parents/grandparents want them to be able to not only understand but communicate in Russian. The books take into consideration the specifics of this audience and make sure the kids have fun while learning.